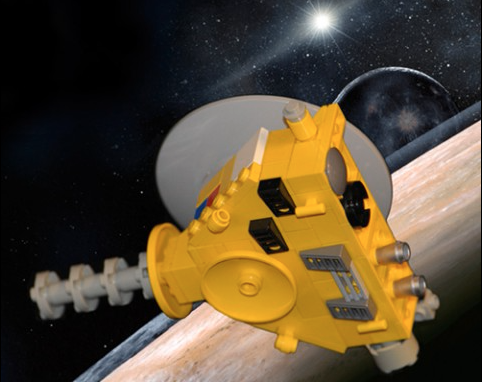 [SatNews] While there have been debates whether Pluto qualifies as a planet or not, apparently it's important enough for a spacecraft to tear through the atmosphere clocking a million miles a day to arrive at this destination. An artist’s concept of the New Horizons spacecraft at Pluto. Washington, D.C. – One of the fastest spacecraft ever built — NASA’s New Horizons — is hurtling through the void at nearly one million miles per day. Launched in 2006, it has been in flight longer than some missions last, and it is nearing its destination: Pluto. Closest approach is scheduled for July 2015 when New Horizons flies only 10,000 km from Pluto, but the spacecraft will be busy long before that date. The first step, in January 2015, is an intensive campaign of photography by the Long Range Reconnaissance Imager or “LORRI.” This will help mission controllers pinpoint Pluto’s location, which is uncertain by a few thousand kilometers. He likens New Horizons to Mariner 4, which flew past Mars in July 1965. At the time, many people on Earth, even some scientists, thought the Red Planet was a relatively gentle world, with water and vegetation friendly to life. Instead, Mariner 4 revealed a desiccated wasteland of haunting beauty. New Horizons’ flyby of Pluto will occur almost exactly 50 years after Mariner 4’s flyby of Mars—and it could shock observers just as much.